Tonight I want to share with you a tip on how to improve the appearance of your home’s interior and exterior and achieve a lighter and brighter look in EVERY room! All you need to do is clean all of your windows! Who knew? Well, you probably already did, but who in the world wants to clean all of their windows? It’s not a fun task to DIY and in my home it’s even a bit dangerous. Fish Foam was one of our Haven sponsors this year. I loved their glass cleaner so much that I was uber excited to try out their Fish Window Cleaning service. And let’s just say I REALLY needed my windows cleaned. They were beyond embarrassing. And yes, we have a minor spider problem going on outside. And here is one more picture of just how bad things were around here (just in case the spider egg infestation above wasn’t enough proof for you)….. Okay. Ew. I apparently took the cliche saying “I don’t do windows” a bit too literally for too many years. 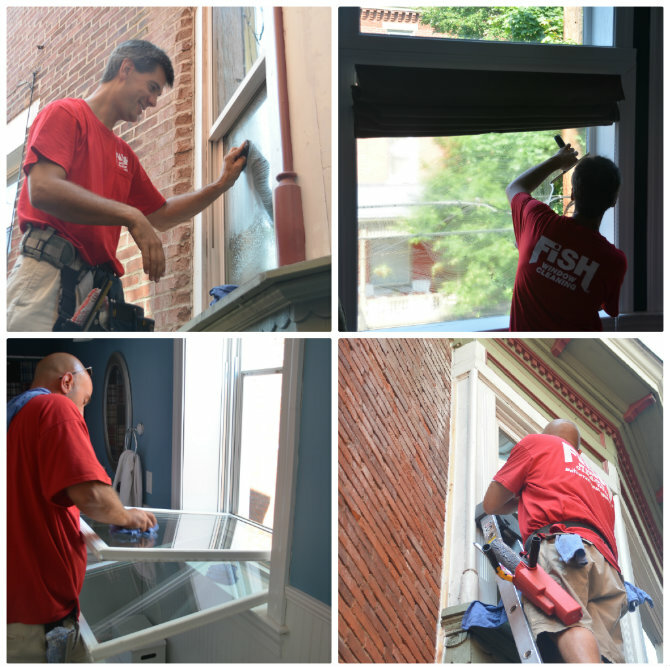 The Fish Window Cleaning team attacked every window in a complete cleaning invasion. They even wore booties on their feet! 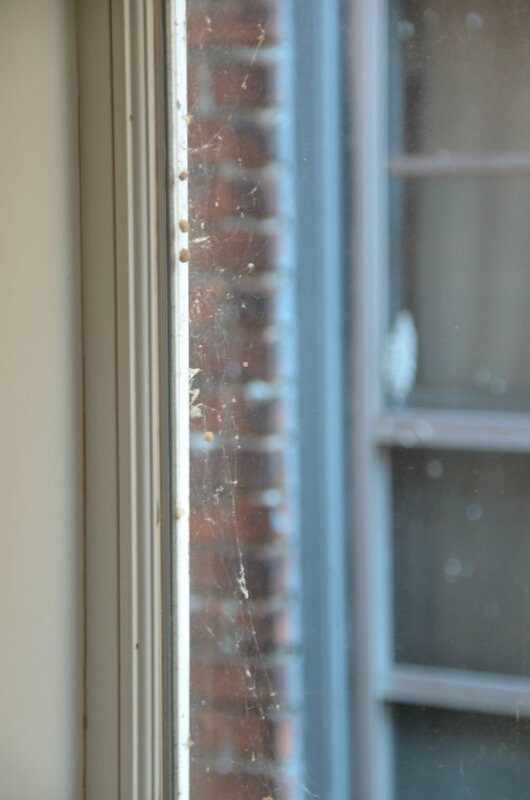 (As if my floors were clean enough to require booties—uh, guys…did you see the my windows?) Matt helped by sitting on the couch and rummaging through a toy basket :). The beauty of hiring other people to do things for you is that you can take pictures of your husband sitting on your couch rummaging through a toy basket! The Fish Window Cleaning Team were like spider-killing-window-cleaning-superheroes. They even climbed tall ladders to get at all of the hard-to-reach windows! These two pictures do NOT do justice to the true before and after. Just know that these were the same windows with the spider infestation and grime. I am thrilled to be able to SEE out of my windows again! It’s lighter and brighter and cleaner looking in every room. Thank you Fish Foam! 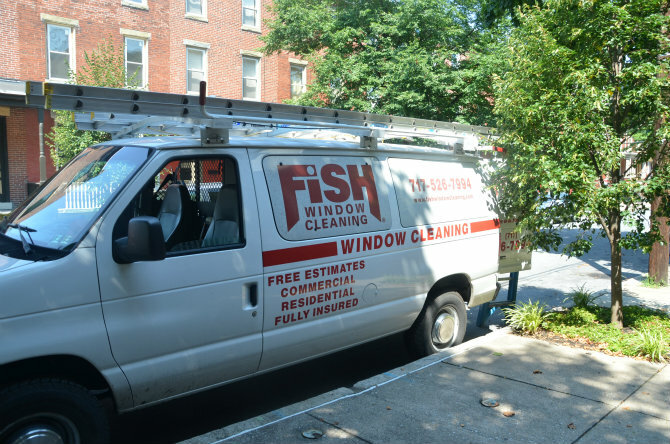 Dislosure: I received window cleaning services free of charge from Fish Window Cleaning but was not compensated for this post. All opinions are my own. And now let’s see what tips and tutorials you have for us tonight! If you missed the Tutes & Tips Not to Miss from last week be sure to check out the features! If you’d like to link up, please be sure to read the rules. Remember that everyone with a tip or tute is welcome to link up but only those who link back to me within their post will be featured. Fish look like they are really good at what they do. 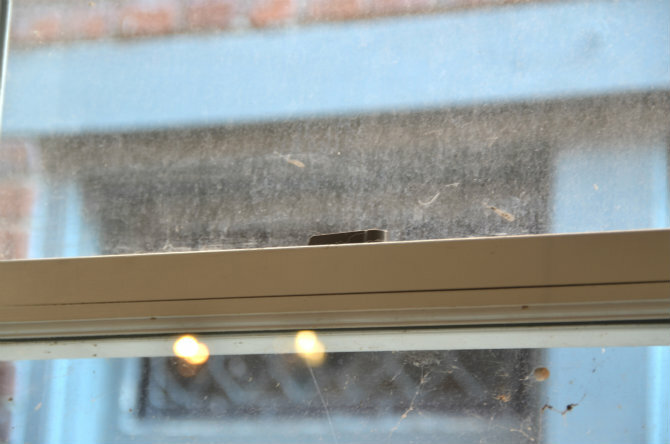 I despise cleaning my windows, especially when they start getting covered in cobwebs – yuk! Wanted to say thanks for hosting week after week! I haven’t posted in ages and am happy to say I finally have a new blog post to link up! Love all the inspiration here each week, and missed being a part of it! Wow, your windows look great! I need them at my house!! Thanks for another great party. Fish Foam service sounds wonderful! 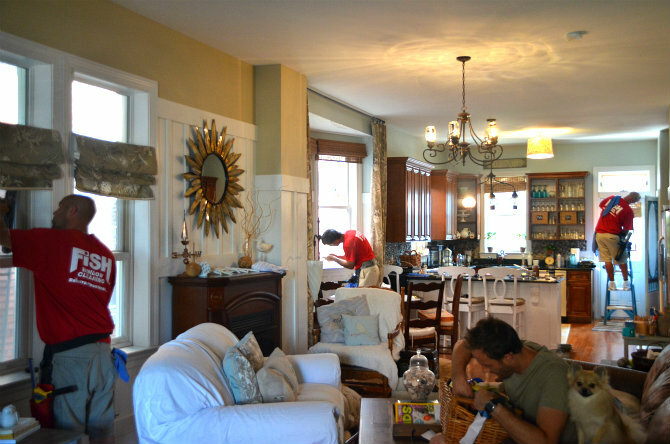 This house has so. many. windows. I love that about it, but my goodness! And no one but me ever cleans a window. So the thought of the Fish Foam service sounds awfully good! Beth, I can totally relate. 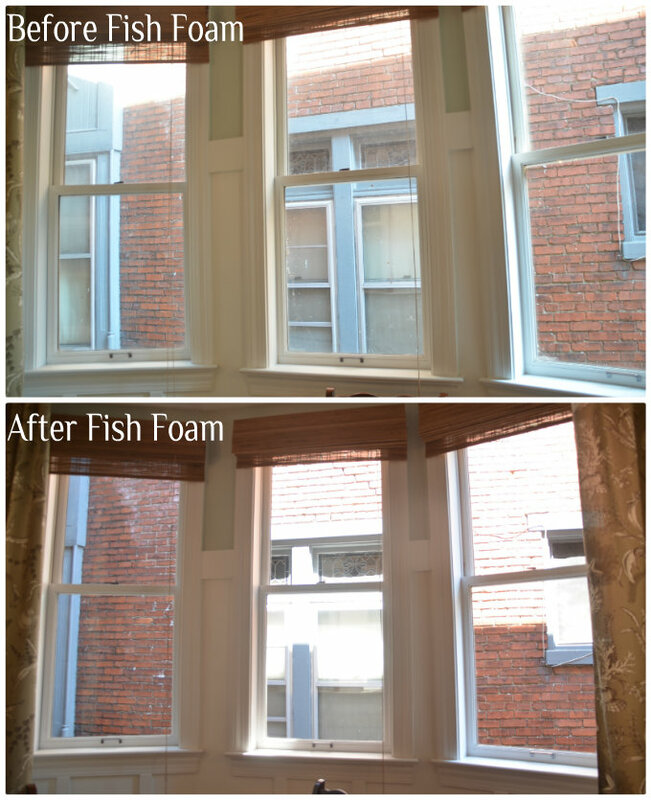 We just had our windows cleaned by FISH last Friday! It was a joyous occasion (and also embarrassing at how nasty my windows were). Clean windows give you a whole new view of the world! I love clean windows!! ugh. spiders. My house is like a science fiction movie. I honestly think they are trying to capture me because they keep running webs between my car and the house. You’re right about the windows though – off to see if Fish is near me. I’m so happy to be linking here, thanks so much for the fun party and I hope you have a fantastic week! Very nice windows! I could use a mega cleaning too! I linked up my Frosted Martini Glasses. Thank you for hosting! Your windows look great! I know you’ve had a smile on your face every time you walk into a room and see the light pouring in through your sparkiling windows. Thanks for hosting! And thank you for your encouraging words. It means a lot! Thanks for hosting. Your windows looks great. That reminds me, I need to get mine cleaned! Oh, my spiders! I need these fellas to come de-spider and clean my windows! Now you have me looking at my windows!…I am overdue for a cleaning! Thanks for hosting today! Thanks for hosting cute mom!! BTW-your windows look amazing!! I wonder if they’d come to Curacao? 😉 Thanks for the party! Thanks for hosting, Beth. 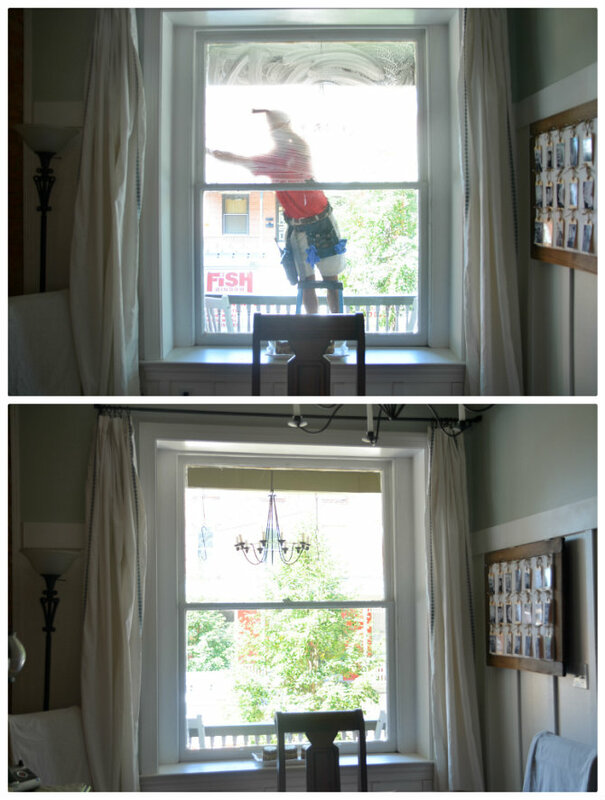 The windows look great and I agree that some windows are really tricky to get at especially since my husband does not like heights. Thanks for hosting! There are already lots of great ideas up! Thanks so much for hosting this party. And thanks again for the feature. Your windows really sparkle! Have a great week! Wow! 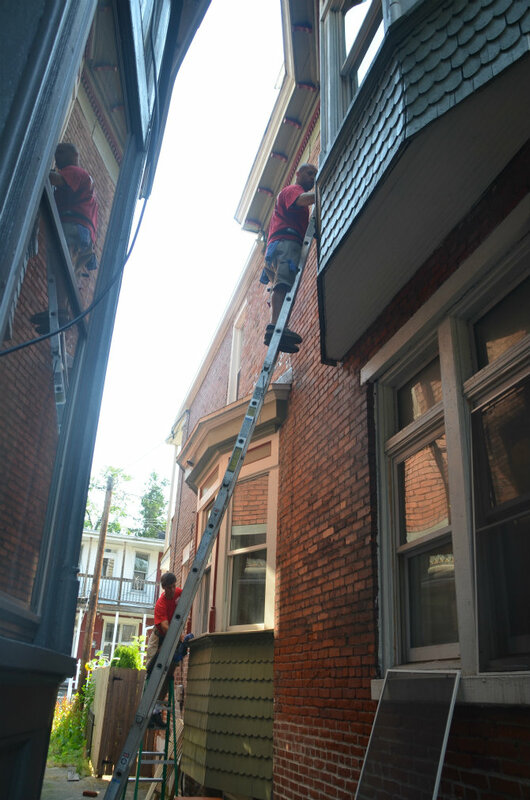 Check out those ladders up the side in the alley! I have been hearing about Fish Foam all over, but hadn’t seen any real “in process” reviews before — very nice! Thanks! I love Fish Foam. Best glass cleaner I’ve ever used! Thank you for hosting! Thanks so much for hosting! Enjoy your week.